Don’t pour all of your time and energy into getting thousands of superficial likes and followers. Why? Because it’s better to focus on authentic relationships—built one reader, writer, or industry professional at a time. Maybe. Or maybe they’ll turn off your notifications after they enter XYZ giveaway. Maybe they’ll accept your friend request, and then put you on a restricted list. Maybe they only sign on to Facebook or Twitter twice a month. Maybe they only check a certain follower list on TweetDeck. Maybe you’ll solicit-spam them to the point that they vow to never read your books, because that follower drive reeked of desperation. The point is it's okay to spend time on social media, it's okay to add follow options to your giveaways, but remember: Instantly inflated numbers won’t help anything but your ego. You have to nurture those relationships, or else the numbers are useless. ...annoying the hell out of everyone on Facebook. Speaking of spam, it’s not always direct. Imagine you belong to eighteen Facebook groups: a few that welcome book promotions, several intended to connect authors with reviewers, some specific to your genre, and a couple about your niche market. Good for you. But if you’re plastering the walls of those groups with half-assed book teasers and promo pics, news of your latest giveaway, review pleas, unsolicited excerpts, and sale information several times a week... guess what? In our circles, group membership tends to overlap. The same people will see your advertisements clogging their newsfeed over and over again, each and every week. You’re tainting your work. Cheapening it. Yes, it may get you a sales bump in the short term, but it is not helping your brand. Everything in moderation, my friends. ...assembling a spam squad under the guise of a street team. A good street team has a manageable number of (typically hand-chosen) members. They work together with specific, reach-extending goals and guidelines. If an author creates one with the sole purpose of assembling a concentrated army of marketing minions, they're doing it wrong. Let these words describe and govern your actions: strategic, positive, resilient, and patient. A tactic that works for one of your friends may not be a good fit for you. Take everything into account—category, genre, following, etc.—and decide whether or not this will impact your sales and/or standing in a positive way. Three years down the road, will you be glad you spent time and money on this? Are you just mimicking someone else’s efforts, when you could you think of a better idea or adaptation? Don’t stay two steps behind everyone, just because you’re waiting to see what they'll do next. Question of the Week: Do you have any marketing tips (or peeves) to share? This is such great advice. I so agree with it all. And I know I miss a ton on Facebook and now Twitter since I just joined. Having tons of followers anywhere doesn't mean that they will read your news about your book. One thing I recommend when going on blog tour is picking blogs with good traffic and including a giveaway with the interview/post. You can do a giveaway posted on several of your tour stops to save money. Even the popular book review blogs don't get much response unless there is a contest. Smart advice! It is about building relationships. A group of key friends and fans will do more for you than a mass of just everyone. "Instantly inflated numbers won’t help anything but your ego." I love this. So much good information. I have an author friend, Donna Hosie, who took the slow approach. Patience is indeed a virtue in a long-term marketing strategy. Hers has paid off. Love this advice. Another one is don't just tweet about your book. I've seen authors do that. Sometimes I unfollow them. Other times I just don't read their tweets anymore. I've seen some who just tweet quotes from the book. And I hate it when people follow me just to get their numbers up...especially when they unfollow me once I've followed them. Brilliant stuff. I've seen this kind of thing before, people think if you don't do it 'now', it can't be done. But slow and steady wins the race! Great article. There is a lot of great (and I'm sure hard-earned) advice in here. If it weren't for the follow option on Blogger, I'd get rid of the following widget all together. Having the numbers up there drives me crazy because I don't care, and neither should anyone else. I used to check my follower numbers, my visitation numbers excessively but have, thankfully, quit doing that. I've also deleted people from my newsfeed for constantly talking about their reviews or numbers at Amazon. It just gets tiresome. Some of our weird obsession stems from the perceived pressure from the publishing industry and the ambiguous, almighty perception of "platform". But I think you're exactly right: find your own way to do this and be a thought leader. Love this advice! Especially keep pressing forward. :) Thanks, Carrie! I agree with all of your points. I've followed at least one author on Twitter who's kind of obnoxious with the self-promotion. "Look! Another awesome 5-star review!" "Just a reminder that my giveaway is still going strong!" "Here's a chance to buy my book for only 99 cents!" "Someone mentioned my book in this newspaper!" It's also important to focus on the quality, not quantity, of your followers and fans. Many people get into a writer, singer, actor, band, etc., just because of current wild popularity and media hype, but you'll know whose fandom/love is genuine and whose was only based on popularity and fashion by who's still interested after all the hype has died down. these are great tips. one of those things i need to educate myself on more just in case...you know, for my future dream. thanks for posting it! Good stuff, Carrie. I try to keep my social media time at 10 minutes or less each day; the rest of the time, I'm writing, revising, and subbing. That's fantastic! I'll have to go read up on her. :) Thanks, Donna! It certainly does! Tortoise mentality, FTW. :) Thanks, Alex! A street team is a group of (awesome) individuals--usually book bloggers and/or dedicated readers--who support a particular author. Their efforts are typically coordinated, i.e. They might schedule a blitz where everyone spreads information about a new release in hopes of it reaching a specific ranking goal. Other times, the author might send out bookmarks for the street team members to pass out in their hometowns. That way, they extend their reach. Oh, I agree. Wouldn't it be nice if the follower option acted like the follow by email option? The list would still be in place, but we wouldn't have to see (and obsess over) the numbers. Half of the time, that's what distracts us from our real goals--like connecting with readers. Onward and upward! :) Thanks, Meredith! Ugh. Don't you hate that? I can take it once or twice a week, but after that I want to do an all-caps reply, i.e. "WE GET IT." I'll annoy the crap out of everyone during a blog tour, but after that, you're unlikely me to see me say much about my own books. There are far too many other interesting things going on in the industry. I'm actually doing things a bit different with the release of my second novel in my Shadow Jumpers series. I'm trying the "stretched out" approach, one where I try not to be the bane of blogosphere existence for a two month period, plaster FB posts with links all day and fill Twitter with crap. Going to try to be a bit more active on a social media outlet of choice to work on building things slowly. Guess I'll see how this works...because insta-splash-me-everywhere didn't seem like a hot-tastic success lol! Good advice, no one wants to be bombarded with promos. I'm so glad I stopped by here today! I sometimes get myself in knots comparing my efforts to others, though my heart says to just keep writing good books and allow it to happen naturally (well, with a little prodding) so the fans are the real thing. Slow and steady wins the race, right? If you're trying to pitch a self-published book to me, it has to be extremely well done. I highly dislike people pushing for a novel they didn't even attempt to polish and get published that they threw on Amazon for $.99. Prove to me it's worth my time. Haha! I was wondering if anyone would pick up on that. ;) Thanks, Natasha! 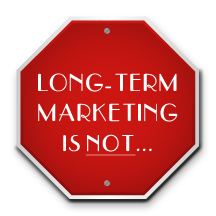 I don't think most people think of marketing in the long term, unless they're marketing majors. ;) Ah, the lessons we have to learn, eh? It's a shame, isn't it? :) Thanks, Crystal! Long-term marketing is not driving yourself nuts by trying to blog, comment, edit, blog, comment, blog, read blogs, comment. Thanks, Carrie. Awhile back I thought I was developing a brain tumor because I had a constant headache. Realized it was too much internet. And then it occurred to me that very successful writers weren't blogging as much as they were producing works. Gave me moment to pause. Fantastic advice. I truly love this. Very level-headed and wise. It's so easy to get caught up with the numbers and forget to take the time to do it right. I'm very tired of seeing overlapping blog tours. And then there are those challenges to friend or follow 50 new people, with the implied agreement they'll do the same right back to you. What do those numbers mean? You had too much time on your hands. Thank you for a constructive post, Carrie. Aww... thanks, Morgan! I appreciate that. <3 I love watching your career unfold, too!